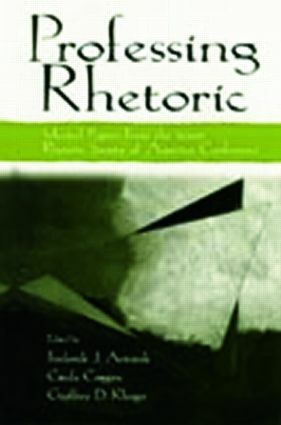 Representing current theory and research in rhetoric, this volume brings together scholarship from a variety of orientations--theoretical, critical, historical, and pedagogical. Some contributions cover work that has previously been silenced or unrecognized, including Native American, African American, Latino, and women's rhetorics. Others explore rhetoric's relationship to performance and to the body, or to revising canons, stases, topoi, and pisteis. Still others are reworking the rhetorical lexicon to comprise contemporary theory. Among these diverse interests, rhetoricians find common themes and share intellectual and pedagogical enterprises that hold them together even as their institutional situations keep them apart. With its origins in the 2000 Rhetoric Society of America (RSA) conference, this volume represents the range and vitality of current scholarship in rhetoric. The conversations contained herein indicate that professing rhetoric is, at the turn of the millennium, an intellectual activity that engages with and helps formulate the most important public and scholarly questions of today. As such, it will be engaging reading for scholars and students, and is certain to provoke further thought, discussion, and exploration. Rhetoric and Ethics: Is “How Should We Proceed?” the Wrong Question? Ending the War between Science and Religion: Can Rhetorology Do the Job?